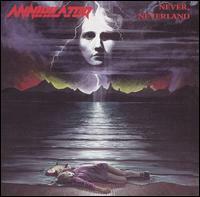 Never, Neverland is the second album by heavy metal band Annihilator. It was released on September 12, 1990 under the label Roadrunner. The album was re-released twice: 1998 with 4 demo tracks as bonus tracks and again on September 9, 2003 in a two-disc compilation set along with Alice in Hell, entitled Alice in Hell/Never Neverland (as part of Roadrunner Records Two From the Vault series).